Well, I'm a couple of days later than last week due to a very busy top of the week- we are in technical rehearsals for Mojada at work, so that means a week of those lovely 10- and 12-hour days! 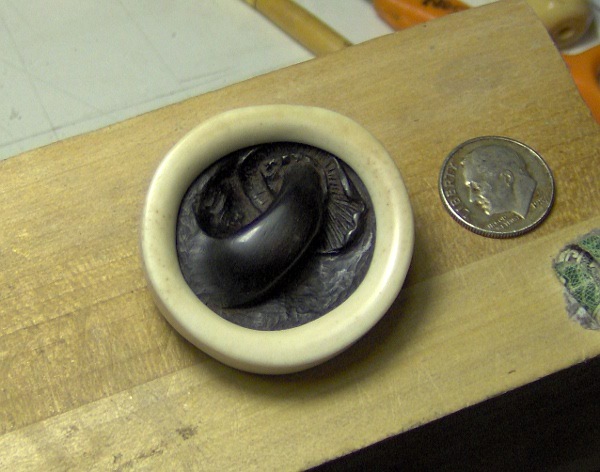 This is a netsuke I made in 2008. The materials are bone, ebony, and silver. 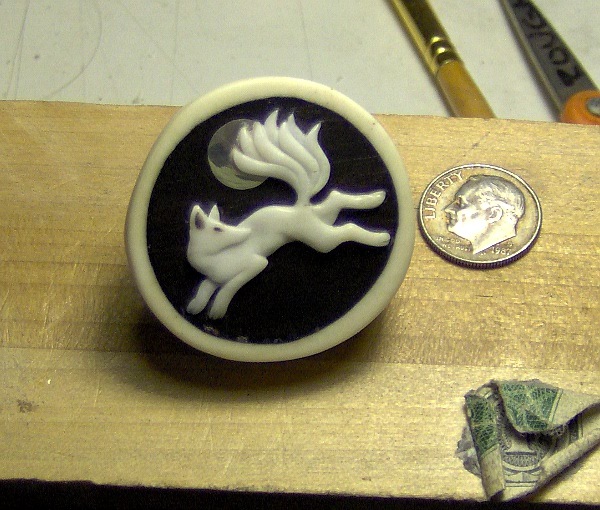 The front shows a white seven-tailed kitsune (not quite mature enough for all nine tails) and full moon, while the back side is a relief carving of mushroom, the cord opening passing between the mushroom stem and background. The ojime accompanying it was simply a plain bone bead (not pictured). The set was made for a dear friend and given to her as a wedding gift. I appreciate the challenges to fitting the bone and wood parts together, most likely by straight carving and filing. That kind of effort inspired me to learn to use a small lathe. I had been curious about whether or not netsuke-shi used lathes in centuries past and found a reference in an old booklet on line (that I later purchased) that mentioned the use of a lathe for making the hollow and pierced ryusa netsuke. 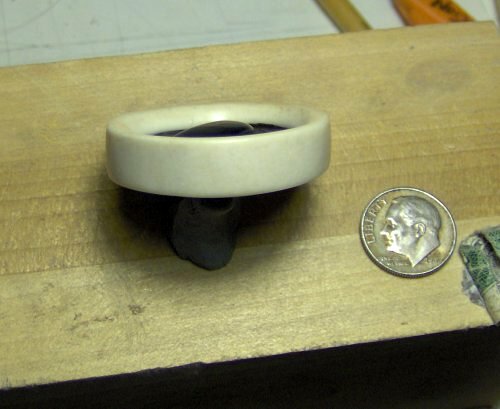 A lathe would make round forms and more easily fitted lids. Your "found" shape of the bone and the wood insert has a freshness to it. Might you be willing to describe your inlay technique? My own work did not include more than eye insertions or little dot accents, and am interested in how others accomplish inlay. Yes, the fitting was all carving and filing. A lot of work! I got pretty close to a good fit all the way around, but still had to fill a couple of small areas on the perimeter with an epoxy and ebony dust mix. Thankfully it's all dark enough that it doesn't show too badly. A few fragments of bone got into the largest gap in the seam (near where the fox's front paws are), but at the time I decided I liked them there and left them, even if they do draw attention to a flaw in the craftsmanship. For inlay, and on a larger scale, fitting elements together on this piece I shaped the cavities, fitted surfaces, and inlay pieces to allow for the adhesive to give a mechanical as well as an adhesive bond. On this piece I used a combination of gel CA glue and runny CA glue. For the inlay moon, I cut a shallow groove into the surface of the narrow circumference surface all the way around. 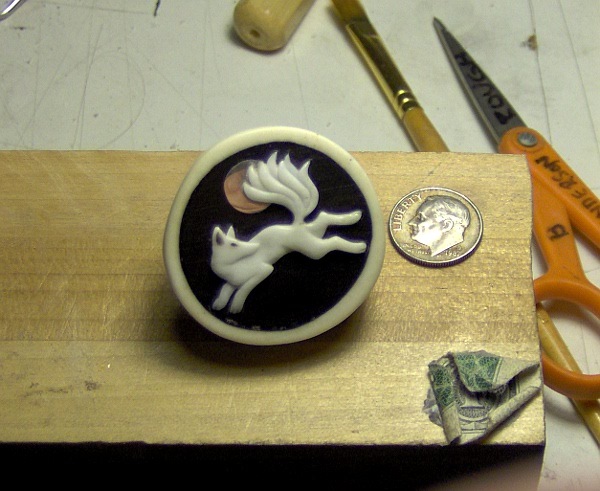 The silver moon was 18g, I think, so thick enough to allow me to make a groove with a 0/6 jeweler's saw blade. Inside the inlay pocket, I angled the walls of the pocket back under the surface of the wood a little. That way when filled with inlay and glue, the adhesive would extend into the inlay a little, as well as reach under the wood a little, preventing the piece from coming out easily even if the bond between the wood and the silver were compromised. For the main inlay glue, I used gel CA mixed with a little fine ebony dust. I discovered that with this I had to work fast as the cellulose catalyzes the CA! I had to do it twice because of this When I do it now, I use water clear epoxy 330 or amber 220. Those adhesives are much better for this! The fox sits on the surface like an applique. To help it stay on, I drilled a number of very small holes into the ebony at different angles under the surface that the fox would cover, and a number of very shallow angled holes into the back of the fox. The drill bit was pretty small, somewhere between #68-75(?) I also roughed up both surfaces with coarse sandpaper. Little "fingers" of the glue penetrate into both the ebony and the applique. I used gel CA, but I'd use epoxy now, possibly with some fine fibrous additive to give strength. Or I'd design the fox differently now to include a better mechanical bond. When I went to clean up the edges around the fox, instead of trimming straight down I shaped the glue to curve out a little and have a taper into the wood for a slightly bigger surface area of contact and for lessening the chance that something might catch on the edge of the fox during wear and pop the applique off. Unfortunately you can see it around the tail tips, but at the time I decided that was an acceptable compromise. I was not working with magnification then. Had I been, the edges would have been cleaner. For fitting the bone and ebony together, I did the same thing but on a larger scale- grooves, fingers, and undercuts, with gel CA mixed with ebony powder. Then after the first sanding back/trimming excess glue, I saturated the joints with runny CA glue to take care of any small fissures or low spots. Then final cleanup, sanding, and polishing. The bone on the mushroom side extends over the ebony like a picture frame lip so it can't slide forward and out that way. I have occasionally thought about learning to use a lathe. Making round, fitted forms and long narrow symmetrical forms is of interest to me, but I never got around to allocating the funds or the time to learn it. Not just yet. What have you liked about using a lathe? Are there things that you don't like about it? I'd like to add that I learned a lot of useful things about inlay from reading books on making inlays for musical instruments. Larry Robinson's books on inlay, particularly "The Art of Inlay: Design & Technique for Fine Woodworking" was helpful. Thank you for the descriptions for the techniques and the observations of materials (adhesives). I was pleased to see that you know about epoxy 330. I was introduced to that at some point and learned to appreciate it. The CA glue was not always a good choice for things, but it has its uses. The lathe was challenging for me to adapt to after having spent decades throwing pots on a wheel. Both use a revolving center to spin the material. That is about it as far as similarities, other than a sense of form relationship. The lathe is totally subtractive and the materials have a grain, so the approach to wood removal takes repetition to understand the right and wrong ways to start and follow through with the cuts. My lathe work was always slow and ponderous, being careful to establish and maintain good habits with sharp tools. I never turned enough with the lathe to have it be second nature as with making pottery, but I certainly enjoyed it. I've not turned for a while, but everything is still there and ready to go. I found a good teacher who instilled good habits. My old brain needed practice to get the sequence of steps in order, so that was/is my problem with it. I hope that you can find a good teacher if/when you choose to learn to turn.